MF - HF: 8x 3"
ES503 is a portable 3-amped stereo sound system composed by two passive tops and one 12" subwoofer. 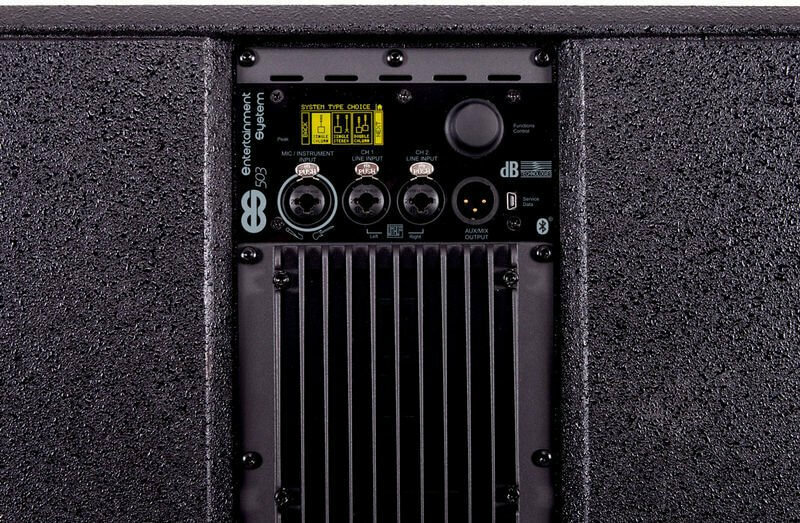 The sub hosts a 1000W power amp module with auto-range PSU and a 3-channels mixer with BluetoothÂ® connection. A powerful DSP â controlled through an advanced user-interface with an OLED display â manages both the coverage of the entire system and all functions of the mixer, making the ES503 a real gem in terms of sound performance and versatility. The ES Series is the result of experience gained from dBTechnologies in the acoustic design of vertical array systems like DVA T Series and MINI. The components of the top are aligned mechanically (Logarithmic Curved Column Array) so as to increase the coverage of the vertical beam. Furthermore, there is a special âdouble-ringed phase plug" that increases the horizontal coverage and gives a rich and crystal clear sound to the system. The enclosure of the two satellites embeds a slide connection system, which assures perfect top-to-top matching without the risk of incorrect assembly. It also includes the electrical connection between the two tops. The letters A and B marks these two speakers respectively, making them easily identifiable. The âA" satellite receives the powered signal from the subwoofer through a 4-poles male Speakonâ¢ connector and relauch the audio through the quick connection system on top of its cabinet. The âBâ satellite is both equipped with the Speakonâ¢ connector and the quick connection system, but in case of stacked use its position must be over the âA" speaker. In other words, both tops can be used on speaker stands or poles, but in case of vertical array the default setup must be respected. The ES503 is incredibly simple to set up and comes with an intuitive wizard that guides the user step-by-step and automatically configures the system according to the application. The advanced graphical interface allows to enter the heart of the system, allowing you to recall the configuration presets, adjust levels, EQ and create a post/post gain mix for different purposes. The OLED display, visible even in the sunlight, is mounted behind an elegant smoked screen and provides all the necessary information to the total system control. All editing operations are carried out through a single rotary encoder with switch, making them extremely easy and error-free. The ES503 is equipped with a three-channel mixer controlled by a smart DSP. The first channel features a MIC/instrument balanced/unbalanced combo connector with impedance compensation, notch-filter with selectable frequency and adjustable gain with 3 positions (0, +10, + 30dB). The second and third channels are LINE inputs with balanced/unbalanced combo connector. There is a 3-band EQ that, depending on the configuration preset, works as an overall EQ or channels EQ. A preset storable by the user is also available. The balanced AUX/MIX XLR output can be used as a simple mono link connection, to relaunch part of the stereo mix to another speaker system (e.g. : right output to a second ES503), or to create a new mono mix with independent levels for stage monitoring or recording purposes. This output is also provided with a second notch filter with selectable frequency. The ES503 is equipped with built-in BluetoothÂ® stereo streaming, which allows the connection of any device (such as mobile phones, tablets or audio players) with BluetoothÂ® connection. We can consider them as 2 more inputs (for a total of 5), even though levels are common to line inputs. The integrated USB B-type port allows the user upgrade the firmware of the ES503, ensuring that the system is always updated to the latest version (download from www.dbtechnologies.com). The bass-reflex subwoofer houses a generous 12" woofer and the amplifier module. In addition to the input connectors and controls of the user-interface, there are two Speakon outputs and a VDE Mains connector. The enclosure, sturdy and stylish, is made of birch plywood coated with a durable scratch-resistant black coat, which makes it truly road-ready. Two recessed handles (one per side) help easy transport. 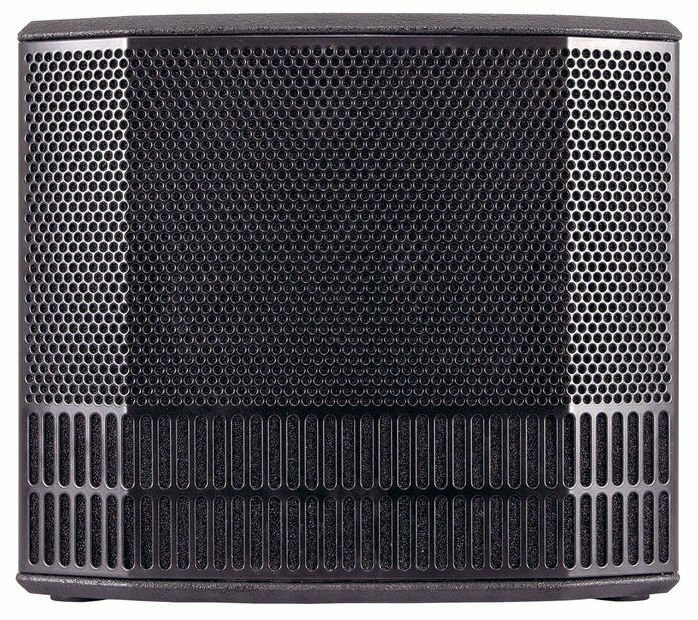 Finally the metal grid with foam, in addition to protecting the woofer and give a very elegant and professional look, helps the reflex effect. The lower part of the grid, placed right on the reflex ports, have in fact holes with a larger diameter to enhance air flow. The ES503 bundle is composed by subwoofer, two tops, a D25mm pole and a Speakon/Speakon cable to connect the sub to the first top. 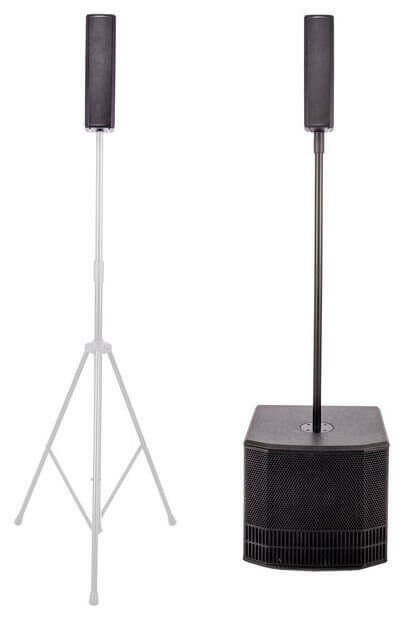 The speaker pole is splittable in two segments for easy transport. The system also provides a large group of accessories, such as D25mm speaker stands, two 25mm tripod stands with transport bag, speakon-speakon cable kit, wheel trolley, a bag for the ES tops and the D25mm pole, and a bag for the 12" subwoofer. In the first option the two satellites are connected top-on-top and are placed on the subwoofer through the supplied D25mm pole. The system is used in mono so all inputs are routed to both outputs in mono. Of course the user can adjust volumes, 3-band EQ and send a second mix with different levels to the AUX/MIX output. This second option implies the use of two tripods and two optional Speakon-Speakon cables to connect the subwoofer to the tops placed on tripods. The system is in stereo: The Mic/Instrument input is assigned to both channels; CH1/LINE L (and BluetoothÂ® L) is assigned to Output L; CH2/LINE R (and BluetoothÂ® R) is assigned to Output R. Of course the user can adjust volumes and EQ. He can also prepare a second mix with different levels for the AUX / MIX output. The third option uses two ES 503 systems in single column mode: one of the two becomes the master for the second, feeding the signal thanks to the integrated balanced output channel. This way, both system are driven by the master's on-board mixer and any setup is guided through the master 's OLED display. Weight (Top): 1.9Kg â 4.19lbs. Weight (Subwoofer): 16.4Kg â 36.16lbs.